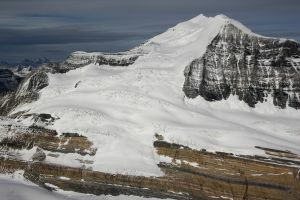 This peak is #13 on the Height List for British Columbia .Clemenceau was first climbed in August of 1923 by D.B. Durand, H.S. Hall, W.D. Harris, and H.B. DeVilliers-Schwab via the W face, which is now the standard route. After the Durand, et al., expedition, the next party into the area was that of 1927 and included A.J. Ostheimer, the guide H. Fuhrer, J. DeLaittre, W.R. Maclaurin, and D. Hoover; this group made a number of first ascent of peaks near Clemenceau. In 1936, the expedition of E.R. Gibson, including S.B. Hendricks, R.C. Hind, and J. Southard, also made some first ascents. The last of the pioneers of the Clemenceau Icefield were G.I. Bell and J.R. Rousson, who entered the area in July of 1951, and made the first ascent of the NW ridge of Tusk. Name Notes: Adopted in 1961, after Georges Clemenceau, a war correspondent with Ulysses S. Grant and a Premier of France.